Mini-pupillages are short unfunded periods of work experience with Chambers lasting up to one week. They provide an opportunity for mini-pupils to meet members of Chambers, to be introduced to the type of work we do and to life in Chambers. Mini-pupils will typically spend their time attending court with members of Chambers, reading papers, carrying out research and drafting. Prospective pupils are encouraged to undertake a mini-pupillage at Francis Taylor Building. Although we consider mini-pupillage to be a useful opportunity to meet prospective pupils, it is not a pre-requisite for their selection and our mini-pupillages are not assessed. Francis Taylor Building offers a total of approximately 40 mini-pupillages per year, split into three periods coinciding with the court terms: January to March, April to July and October to December. Mini-pupillages are not offered on Bank Holidays or during the Christmas, Easter or summer vacations. Chambers’ mini-pupillages are designed to be most useful to those who are (or who will be shortly eligible) to apply for pupillage. Law students must be in at least their second year of a qualifying law degree by the time they undertake a mini-pupillage with us. More information on qualifying law degrees is available here. Non-law students must have at least started the GDL by the time they undertake a mini-pupillage with us. If you are unsure whether you are eligible or would like to request an exemption from the above requirements please contact us at the email address below before applying. The application deadline for mini-pupillages from 29 April to 26 July 2019 is midnight on 5 April 2019. All applicants will be contacted with the outcome of their application after this time. A CV of no more than two sides of A4 detailing your relevant qualifications and experience, including a list of all mini-pupillages so far undertaken or confirmed for the future. 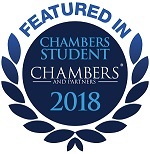 Chambers does not interview candidates for mini-pupillages and references are not required.